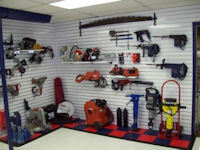 Delaware Equipment Rental started out as a Taylor Rental in 1978. Our location was on Basin Road, across from the New Castle County Airport. In 1991, as our business grew, we relocated to a larger facility on Route 273 & Churchmans Road and changed our name to Airport Rental. 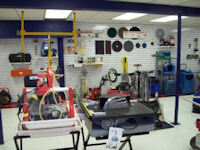 Then in December 2004, we again relocated to our current location at Greenbank & Duncan Roads in Marshallton. In January of 2006, a longtime employee purchased the business and changed the name to Delaware Equipment Rental. The name change is a better reflection of what we do best....provide tool rentals, party rentals, and equipment rentals to homeowners and professional contractors. We also provide other valuable services to you, our customer. These services include: equipment sales, service, and repair, propane bottle refills, boxes & moving supplies, and much more. Need a rental truck or trailer? We are an Authorized U-Haul Dealer. Call the experts at Delaware Equipment Rental in Wilmington & Middletown DE, and let our staff, with over 50 years of combined experience, serve you.